Boca Pointe Country Club, located in the heart of Boca Raton, is one of the most luxurious and popular country clubs in all of South Florida. This masterfully-crafted community is filled with colorful tropical plantings, verdant landscape, and beautiful, shimmering lakes that rest on 1000 gorgeous, perfectly manicured acres. 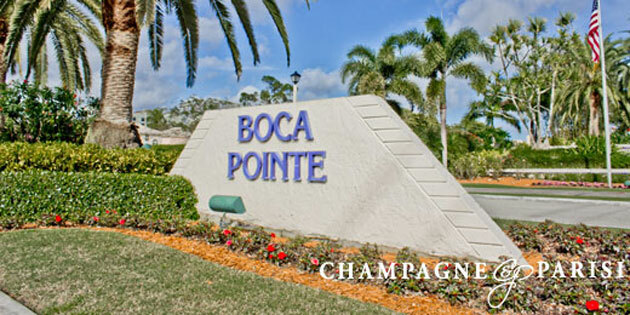 Over the last three decades, Boca Pointe has continued to grow, with a large number of people settling here every year. Starting in 1981, Boca Pointe began as a small, quaint neighborhood; now this bustling country club community is made up of 29 distinct villages, each of which is managed by its own Association Board of Directors. With over 4,000 residences spread throughout these charming villages, Boca Pointe offers homebuyers a diverse selection of homes, with options to suit every taste and style. Within the community one will find patio homes, garden villas, low and high-rise condos, coach homes, townhouses, and, of course, single-family homes. These elegantly-built residences range from 1,100 square foot luxury condos to large 6,000 square foot grand estate homes. Most of the homes in this beautiful community feature breathtaking views of the Hillsboro canal, tranquil natural parks, rolling green fairways, and countless shimmering lakes. From custom estate homes in Encantada to single-family courtyard homes and coach townhouses in El Dorado Village, you can be sure that every neighborhood in Boca Pointe is uniquely and intricately designed. Boca Pointe Country Club offers a variety of membership options perfectly designed to best suit your lifestyle, whether you decide to be a year-round resident or just a seasonal homeowner. Conveniently, unlike many other country club communities, membership to the Club at Boca Pointe is not mandated by any of the villages and is therefore completely optional. The optional club membership makes Boca Pointe a popular choice for homebuyers who want to live in a country club community without the associated membership costs. For golf enthusiasts, there is a specific golf membership, as well as tennis memberships for tennis lovers, social memberships for those just wanting to enjoy the social aspect of club membership or the all-inclusive premier membership which entitles you to the full membership package to the Club at Boca Pointe. Tennis is a favorite at Boca Pointe, with 13 Har-Tru clay tennis courts and a professional Center Court available to members. USPTA professional instructors are on site, as well as the fully-equipped tennis pro shop and the Center Court Cafe. Just outside the tennis center, are two Olympic-sized swimming pools which members may utilize year-round. The Jack Nicklaus-designed 18-hole championship golf course is full of green rolling fairways, beautiful putting greens and gorgeous, pristine lakes. Private golf lessons are offered to members as well as golf clinics which are offered year-round. The gorgeous clubhouse at Boca Pointe features three exquisite dining venues complete with gourmet breakfast options, impressive wine lists, and carefully-prepared cuisine. Also, the amazing 40,000 square foot fitness center offers a wide variety of workout classes, such as pilates, yoga, and aerobics. Additionally, Boca Pointe residents enjoy a full calendar of engaging events and social activities. If Boca Pointe sounds like the perfect community to suit your desired South Florida lifestyle, you may also want to visit other country club communities in Boca Raton, including Boca Country Club and Boca Greens, which also offer optional country club membership. If you would like to learn more about homes for sale Boca Pointe or any other Boca Raton communities, please call us at 561-998-9015. You may also reach us by completing the brief online contact form below and one of our expert agents will reach out to assist you. We at Champagne & Parisi Real Estate look forward to assisting you with all of your Boca Raton real estate needs. Click here to view a complete list of Boca Raton residential communities.